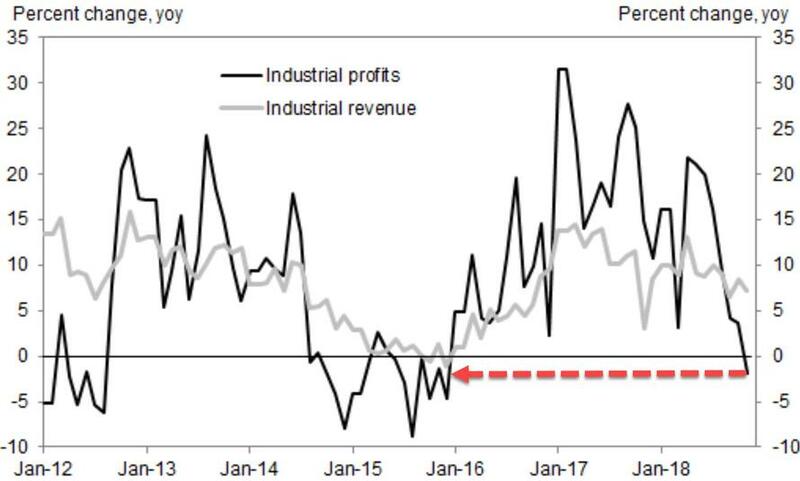 For the first time in almost three years, the profits of Chinese industrial companies tumbled in November, highlighting the effects of slowing economic growth, falling prices, and the trade war with the US. "Slowdown in sales growth and factory gate inflation, combined with rising costs, led to the decline of industrial profits in November," the NBS said in the statement on its website. Profits contracted 1.8% year-on-year in November, vs. an expansion of 3.6% yoy in October. 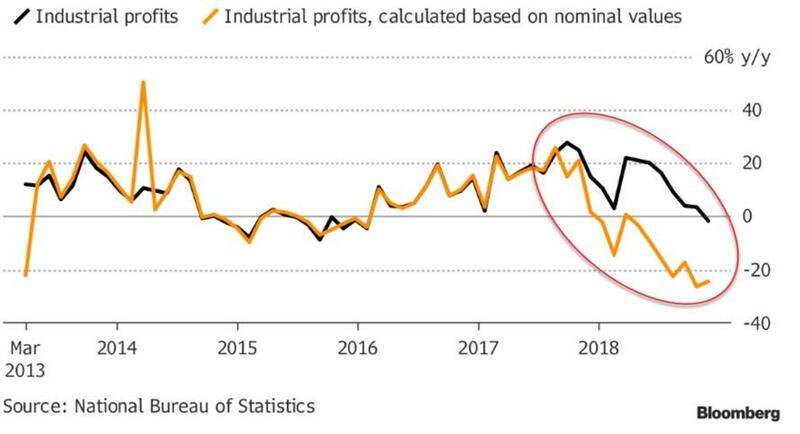 This is the first year-over-year contraction in industrial profits since 2015. In month-on-month terms, profits fell meaningfully after seasonal adjustment by around 7.2% (non-annualized), vs. a contraction of 0.1% in October. In absolute level terms, profits in November were the lowest of the year. 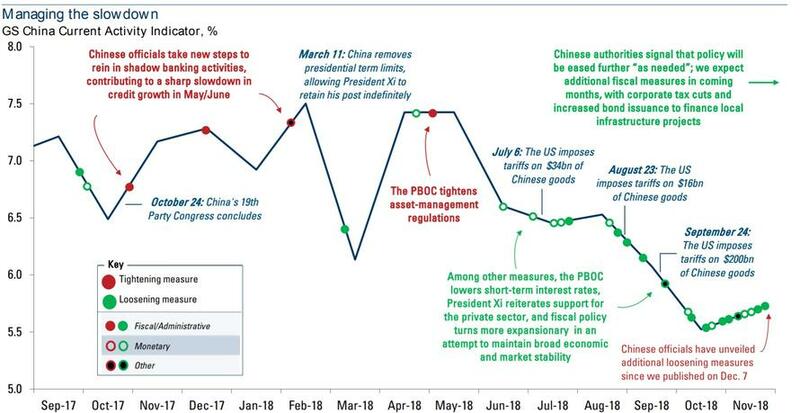 Among major sectors, profit growth turned negative in computer manufacturing, ferrous metal smelting and pressing, and chemical product manufacturing, but improved in general equipment manufacturing, electrical machinery manufacturing and automobile manufacturing. As Goldman Sachs notes, compared with November 2017, profit margins (total profits divided by revenues from principal business) were materially lower by around 0.6pp, contributing to the fall in headline profit year-over-year growth. On a 12-month rolling average basis, both upstream and downstream industries' margins narrowed. Revenue growth decelerated in November, with PPI inflation modestly lower in November vs. October, and the implied real industrial sales growth slowed in November, to around 4.5% yoy based on our estimate, vs. 5% yoy in October. However, flashing red flags everywhere, Bloomberg notes that the official year-on-year growth rate for profits began diverging from the growth rate calculated from the nominal profit figures in 2017, and that continued to be an issue in November’s release. This discrepancy has led many to question the veracity of the official data. And more worrying still, looking ahead, industrial profit growth continues to face headwinds, as Goldman expects both industrial production growth and PPI inflation to soften next year, especially in Q1. And, as confirmed by today's collapse in profits, it's not working.